Description: Tufted perennial with short rhizome. Culms triquetrous, smooth, to 50 cm high, 1–2.5 mm diam. 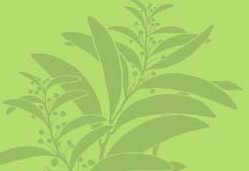 Leaves not septate-nodulose, shorter or longer than culms, 2–5 mm wide. Inflorescence usually simple with 4–10 branches to 10 cm long, rarely head-like; digitate clusters to 40 mm diam. ; involucral bracts leaf-like, 3–6 longer than inflorescence. 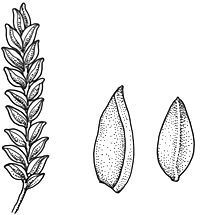 Spikelets flattened, 2–5 per cluster, 6–40 mm long, c. 2 mm wide in side view, 10–60-flowered; rachilla not winged, persistent. Glumes obtuse, short-mucronate, with sides not to thickly several-nerved, 1.5–2 mm long, very dark red-brown to blackish. Stamens 3. Style 3-fid. Nut trigonous, ellipsoid, about as long as glume but broader than it, c. 1.3 mm long, c. 0.8 mm diam., yellowish. Distribution and occurrence: Grows in or near rainforest; north from Minnamurra Falls, extending inland to Barrington Tops area.